Are you in the mood for an Imperial Stout? But, which one? On February 21, Imperial Bottleshop & Taproom will make the choice easy by hosting a festival where you can sample from 13 of Oregon's best! 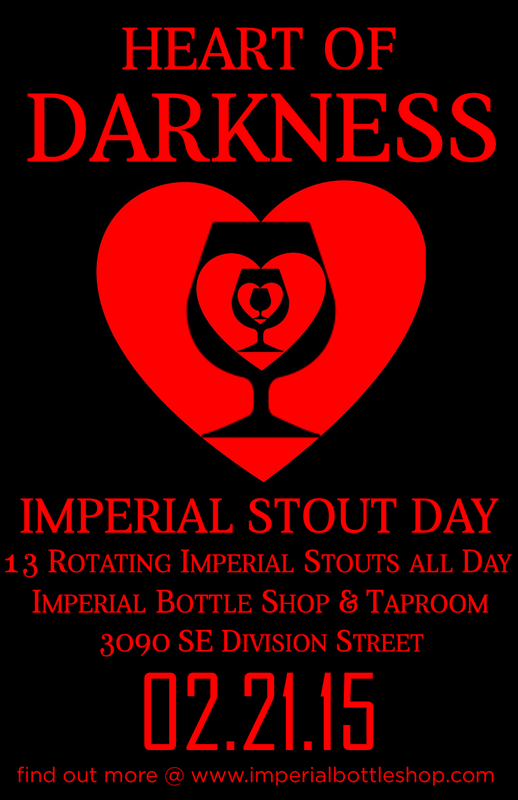 For more details about Heart of Darkness Imperial Stout Day, check out the details below. Portland, OR – On February 21st, Imperial Bottle Shop & Taproom (3090 SE Division St) is hosting Portland’s first exclusively imperial stout beer fest, featuring a variety of 13 rotating local imperial stouts on tap all day long from noon until midnight. Imperial stouts have been one of the most coveted beer styles dating back to the 1800s, when extremely heavy stouts to the Russian empire, which loved the viscous, highly-alcoholic brews perfect for cold weather. Fast-forward a few hundred years, and the burgeoning American craft beer scene sees breweries brewing up stouts with massive grain bills and carefully aging them in choice bourbon barrels, and the very best imperials stouts are hunted like white whales and traded like vintage baseball cards by beer geeks across the country. Tickets are $15 in advance and $20 at the door, and attendees will get a commemorative glass snifter and five drink tickets, each good for a 4 oz pour. Additional drink tickets will be offered for $2 each. Information on tickets and the full draft lineup is available on Imperial’s website, imperialbottleshop.com.